Phuket International Airport serves the popular tourist destination of Phuket Island in Thailand. It is the country's third busiest airport (after Bangkok's Suvarnabhumi Airport and Don Mueang International Airport). A useful guide for travellers, our Phuket International Airport guide includes details of terminal facilities, public transport access and nearby accommodation options. A newly revamped international terminal was officially opened in September 2016. Information desks (tel: +66 76 327 2307) are located in the departure and arrival areas. The tourist service counter (tel: +66 76 327 110) is situated in the departures hall. Driving to the airport from Phuket city centre and vice versa is uncomplicated. From the city centre take Thepkrasattri Road (Route 402) northbound and take a left onto Route 4031; this road leads directly to the airport entrance. The total drive time from Phuket city to the airport is approximately 60 minutes. Phuket International Airport is located 32km (20 miles) to the north of Phuket city. Bus:Buses, emblazoned with a large ‘Airport Bus’ logo, depart for Phuket city centre on an hourly basis, taking around 80 minutes at a cost of THB100 one-way. 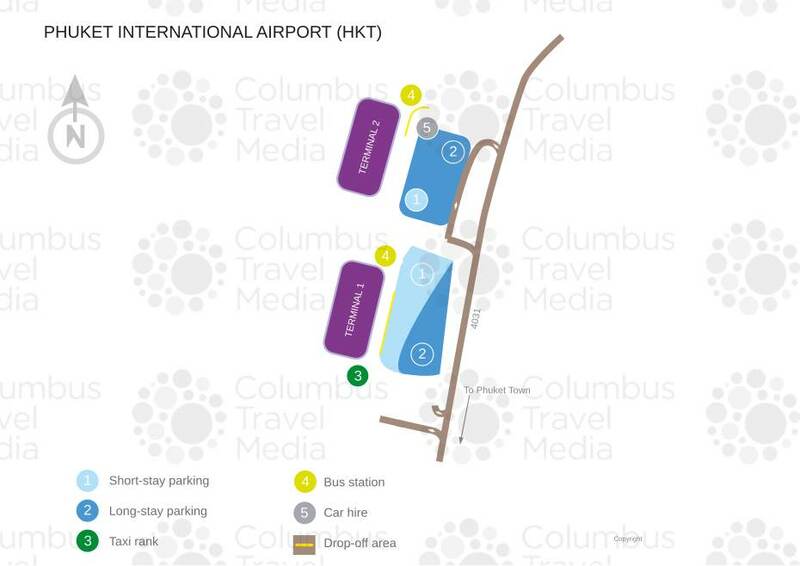 Taxi:The taxi stand is located directly outside the terminal building. A limousine service is also available. Tickets are sold at the limousine counter in the arrivals hall on the first floor of the terminal building. The journey to Phuket city takes about 60 minutes and costs upwards of THB500. There are four currency exchange counters in the arrivals hall and one in the departures area. ATMs are also available. The main restaurant on the third floor serves Thai and international food. Smaller snack bars and cafés are located throughout the terminal. There are more than 10 shops at the airport, including four duty-free outlets in the international departures lounge and one in the international arrivals lounge; these sell liquor, cigarettes, perfume and much more. For queries regarding items lost or found in the terminal contact the main information desk (tel: +66 76 327 2307). A left-luggage service is provided in the domestic arrivals hall. The airport's first aid point (tel: +66 76 327 2307) is located in the departures hall – service hours are from 0600 to 2400. A prayer room for Muslims is available on the third floor. There are currently no conference or business facilities at Phuket International Airport. However, the nearby Dewa Nai Yang Beach resort (tel: +66 76 372 300; www.dewaphuketresort.com) houses a room that can be hired for events. Wi-Fi internet access, free of charge for the first two hours, is available throughout Phuket International Airport. Public telephones are also available within the terminals. A post office is located in the departures hall on the second floor. Facilities for passengers with physical disabilities include lifts, disabled toilets and lowered telephones. The airport also has dedicated parking spaces that are reserved for disabled people in the main car park. Any passengers who may require additional assistance are advised to contact their airline in advance of travel. Both short- and long-term parking is available at the airport car park, which has capacity for more than 400 vehicles. There are two car hire counters at Phuket International Airport, one in the north end and the other at the south end of the arrivals hall. Avis, Budget, Hertz and National are among the companies represented.